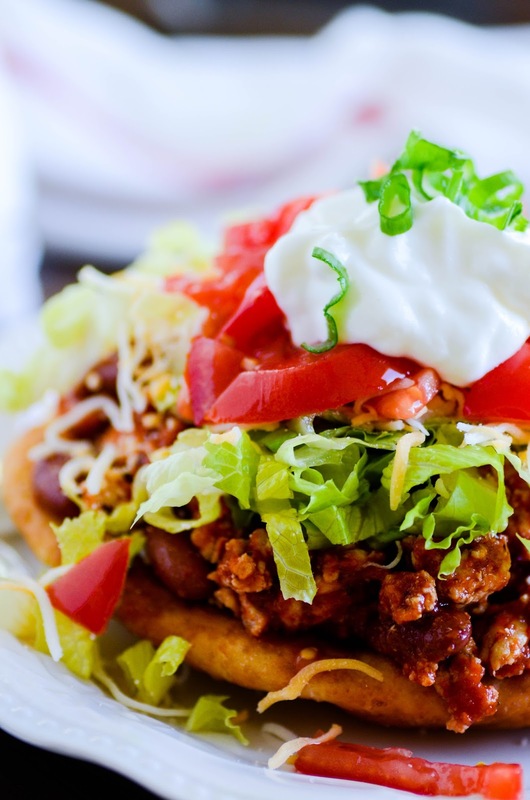 These Navajo Tacos have been one of our favorite weeknight dinners ever! The soft Indian fry bread on the bottom is incredible, and you can even save a few for after dinner to spread with honey butter and jam. Branching out and trying new dinner recipes has seriously been one of the best decisions I've ever made! Not only did it get us out of a major dinner slump, but my kids are discovering all sorts of new foods they never knew they liked! Every time I introduce a new meal, my daughter tries a new food. For instance, when I served these Navajo tacos, she said, "Mom, I think the day is the day that I should try eating tomatoes. I think I'm going to like them." Once I picked my jaw up off the ground, I piled the tomatoes on. I don't think she loved them in the end (her dad doesn't either), but she didn't gag or cry. And she really did eat a few! That is serious progress from where I'm standing, folks. Ok, let's talk about this Indian fry bread for a minute here. Have you ever tried it?? 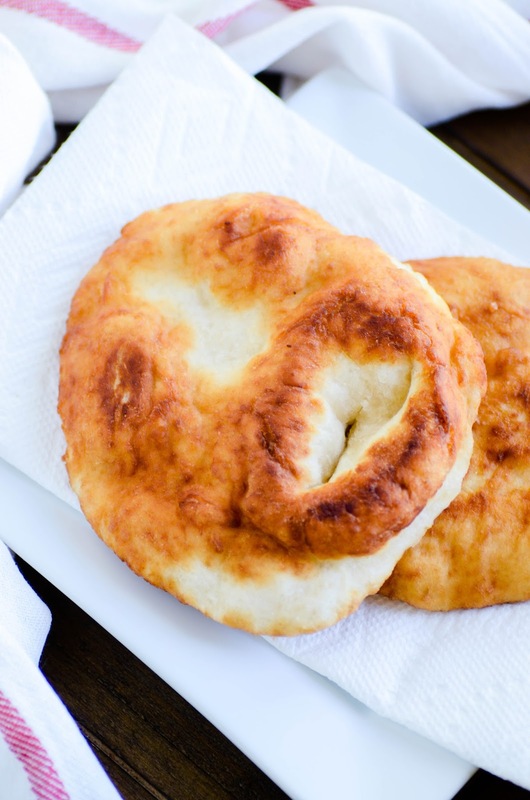 My first introduction to fry bread was in Utah when I was about 12. I was visiting my best friend's grandma, and she tossed some extra bread dough she had in the fry pan. I was intrigued. And when she served it up warm and slathered in homemade jam, I was IN LOVE. So what I'm saying is... you should have some fry bread leftover after the tacos. Slap some honey butter or jam on those suckers, and you'll feel like you've died and gone to heaven! It's like a donut. Almost. But flat. And oh-so-good! I hope you enjoy these as much as we do!! Place the milk and the butter in a microwave safe dish and heat for about 90 seconds, or until the milk is warmed and the butter is melted. You may need to stir. Whisk together the flour, baking powder, yeast, and salt. Mix the wet ingredients into the dry, and mix by hand until a dough forms. Cover and let rest for 10 minutes. Heat the oil in a 10-inch skillet over MEDIUM heat. Once the oil is ready (the oil should bubble if you drip water on it), divide the dough into 8 balls. Working with one at a time, flatten the dough in your palms to be about 6 inches in diameter. Place the flattened dough in the hot oil and fry until golden brown on the underside, and then flip to cook the other side. Remove and place on a paper towel lined plate. Repeat with the remaining dough. Sautee the onion in the oil over medium-high heat for about a minute before adding the ground meat and browning it. Drain the meat if needed (I use a super lean ground turkey and it doesn't need to drain). Add the garlic powder, chili powder, cumin, paprika, beans, chiles, and tomato sauce. Mix and let simmer on low for about 10 minutes (covered). 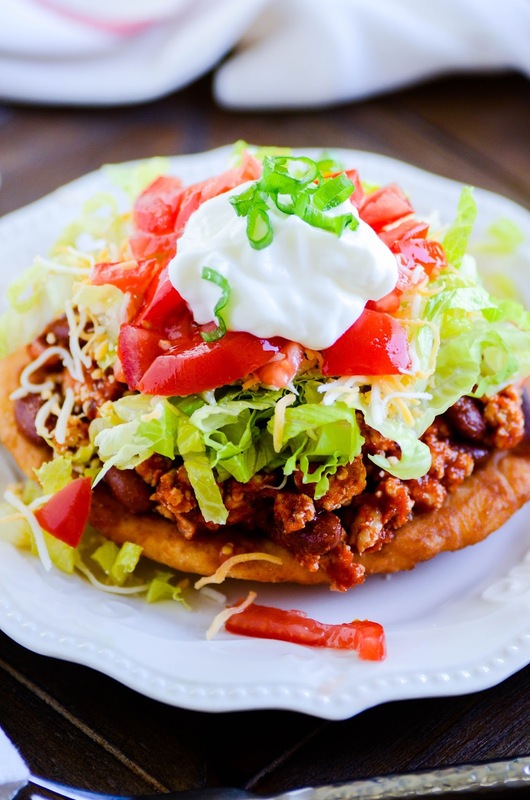 Layer the meat on top of the fry bread and top with any taco toppings you like! Serve immediately.